Turmeric (Curcuma longa) is a staple in most kitchens. Even the least knowledgeable individual among us could probably identify turmeric as the famous golden cooking spice that gives so many dishes in Indian cuisine that beautiful yellow color! Also known as haldi powder, this golden herb has found its way into our hearts and spice racks, and it is there to stay. Beyond its uses in cooking, turmeric is known for a wide range of health benefits such as supporting healthy skin, cleansing the blood, strengthening the immune system, and comforting the joints. 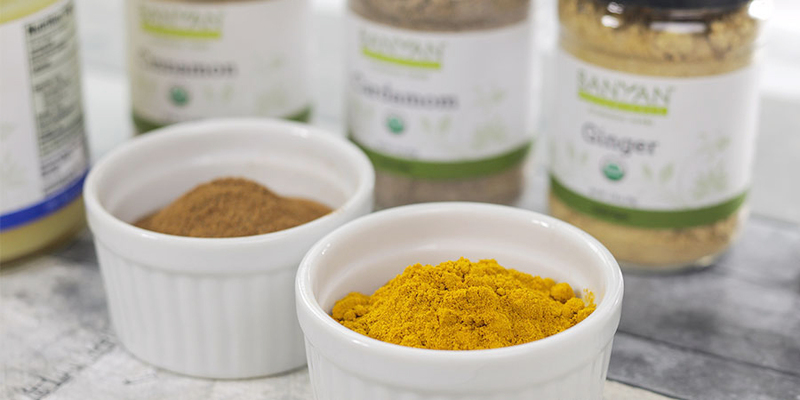 Although it can be effective on its own, turmeric can be even more beneficial when combined with other ingredients that enhance its natural properties. Here, we’ll be discussing how you can take the many health benefits of turmeric a step further by creating a quick, easy, organic turmeric paste that can be used as the base for a tasty golden milk recipe, as a cooking ingredient, and more. The ingredients for this delicious golden paste can be a bit heating for those with a pitta imbalance. We’ll detail some adjustments you can make to cool the mixture, but before you try it at home, we recommend discovering your current state of balance by taking the Ayurvedic Profile™ quiz. Why make a turmeric paste? There are plenty of reasons! It enhances the process of making golden milk. Mix 1–2 teaspoons of turmeric paste into the milk of your choice to create a golden drink that is not only delicious but also good for strengthening agni, supporting the immune system, and promoting healthy sleep. The paste’s base of ghee provides a powerful anupan. When prepared with turmeric paste, golden milk features not one but two powerful anupans (milk and ghee) which help carry the benefits of turmeric and other herbs deep into the tissues. This paste combines turmeric with black pepper and other supportive ingredients. Black pepper in particular is often combined with turmeric to increase the bioavailability of turmeric’s main constituent, curcumin. It brings flavor and nourishment to meals. It can be used for baking, as a curry paste, and can spice up a rice dish. We encourage you to experiment with it, while keeping Ayurvedic food combining guidelines in mind, of course! Turmeric paste gives you options. Your jar of turmeric paste will last up to three weeks in the refrigerator and is enough for plenty of cups of golden milk, bowls of curry, and turmeric paste facials. Each of these processes will be made easier by the fact that you made the preparation ahead of time! *Those experiencing high pitta or seeking a vegan alternative might consider using coconut oil in lieu of ghee. Mix the cinnamon, cardamom, ginger, nutmeg, salt, and pepper into a bowl and set it aside. Simmer the turmeric powder and 1 cup of water together in a saucepan on low-medium heat, stirring constantly. Once the turmeric has been thoroughly stirred in, add an additional ½ cup of water if desired. Keep stirring until the mixture has reached a paste-like consistency. This can take anywhere from 3–10 minutes. Simmer the mixture down and slowly stir in the other spices. Next, add ghee and blend thoroughly. While the paste is still warm and runny, pour it into the glass container (or containers), let cool, and refrigerate. The mixture will thicken as it cools. It may be stored in the fridge for 2–3 weeks, or frozen immediately and thawed out at a later time if you want it to last even longer. You may also add more or less water if you want a thicker or thinner consistency. The more water you add, the runnier the paste will be. Add 1–2 teaspoons of the paste to 1–2 cups of milk (your choice). In a small pot, gently heat the milk on low until warm (not hot). Add the turmeric paste, stirring until mixed completely. Then add your desired sweetener. This is delicious as is, but you can add any additional spices at this time. Serve immediately. 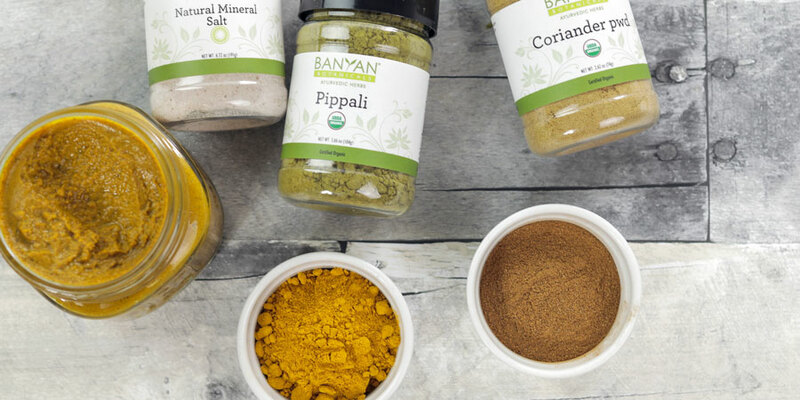 Consider adding pinches of garam masala, pippali, natural mineral salt, and coriander powder to give your turmeric paste an extra kick that will further stoke the digestive fire when added to meals. The amount of paste you use will depend on the quantity you are adding to. Experiment by starting low and building to your desired flavor. Lots of people turn to turmeric for skin health, and the pasty consistency of this mixture already feels like a face mask in its own right. However, its vibrant yellow color can stain your skin and clothing if you’re not careful! Using a base of organic Greek yogurt can be effective in diffusing turmeric’s bright color while also providing moisture for the skin. Add 1 teaspoon of turmeric paste into 2 tablespoons of plain Greek yogurt. Stir until thoroughly blended. You can test the mask at this point by applying a small amount to your skin to see what happens. If it stains your skin, add more yogurt and test again. Leave on your face for no longer than 15 minutes, then wash your face with warm water and wipe dry with a soft towel. * You may have a faint yellow tinge to the edges of your skin. This will generally disappear with a few more washes. *You may want to use an older towel you don’t care about to dry off with, as the turmeric paste will stain the towel. Turmeric paste is incredibly versatile. Try using it for baked dishes such as muffins or cakes, as a base for broth in a soup, in an Ayurvedic smoothie, or however you see fit! Some even enjoy eating turmeric paste directly from the jar with a spoon! Ayurveda provides us with a simple adage, “If you wouldn’t eat it, don’t put it on your skin.” This is important to remember when choosing skin care products.